US President Barack Obama has signed a multi-year farm bill into law which would cut the food stamp program by about $9 billion over the next ten years. 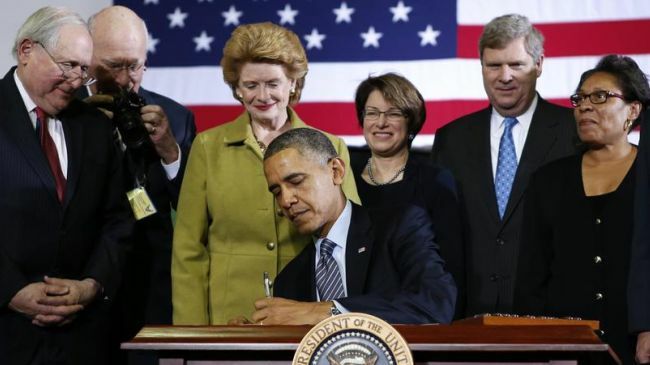 Making an appearance at the Michigan State University on Friday, Obama signed into law the Agriculture Act of 2014 after it was passed by the US House of Representatives and the Senate. The law would cut by about $900 million a year the Supplemental Nutrition Assistance Program (SNAP), on which almost 47 million Americans rely to afford food. The cuts to food stamps were a compromise between nearly $40 billion in cuts to the program approved by the Republican-controlled House a $4 billion reduction approved by the Democratic-controlled Senate. The SNAP underwent a $5 billion cut when a temporary increase in food stamp dollar expired on November 1. Food banks across the United States have already complained that they are facing an increase in the number of their visitors and have to turn people seeking help away because they do not have enough supplies. “Devastating cuts to [the SNAP] have pushed thousands of low-income New Yorkers and emergency food providers to the very brink of survival,” Margarette Purvis, the president of the Food Bank for New York City, the largest food bank in the US, said in January. American doctors have also warned that increased rates of diabetes and developmental problems for young children are among the health risks of hunger which would be a direct result of cutting funding for the food stamp program.